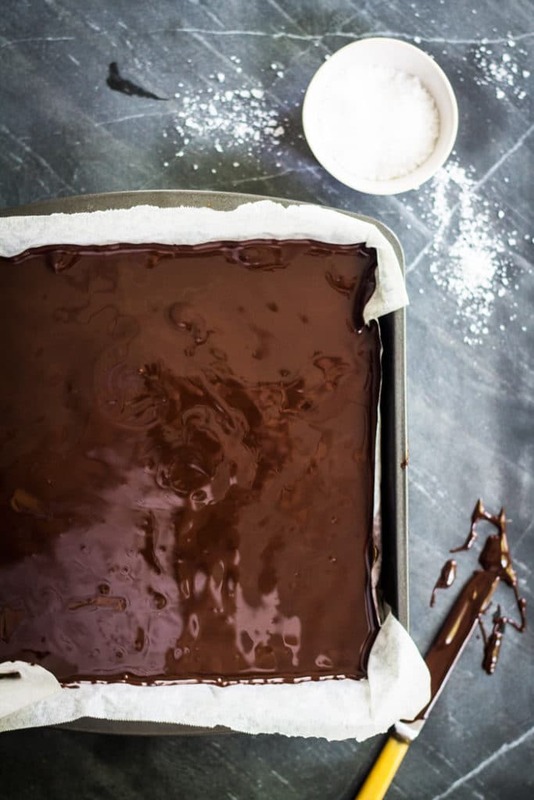 Over the last few weeks my recipes have taken a slight healthy bent – refined sugar free lemon curd, refined sugar free raspberry and lemon cake, raw chocolate bliss balls and healthy quick tortilla soup. But today I will not apologise because this is unashamably sweet tooth heaven. Gooey salted caramel. Rich dark chocolate. Crunchy biscuit. Yes, can you say decadence? 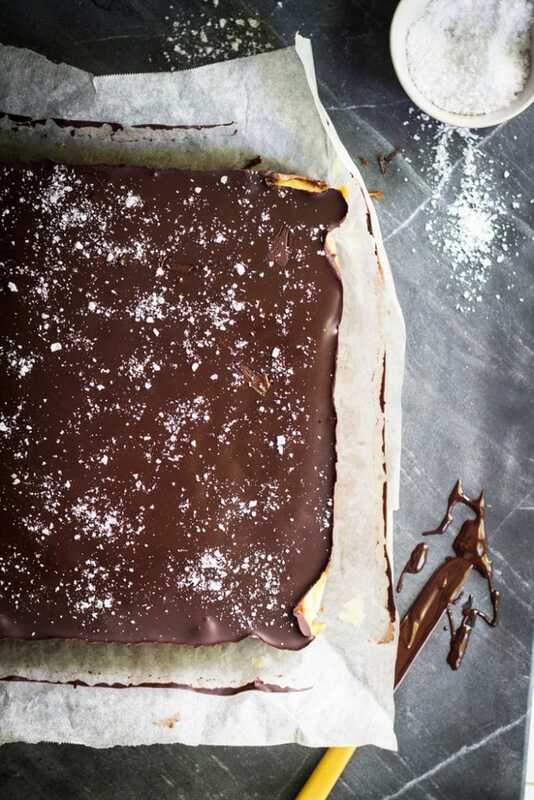 Decadence in the form of my Salted Caramel and Hazelnut Slice. I’m all for being healthy, but I’m also all for living life in moderation and here’s our treat! When I was a teenager I worked in the weekends at the local bakery. At first I started working there to help me pay for a volunteer trip to Nepal (which my grandparents also kindly chipped in for, actually paid the majority for because at $6 an hour my bakery wage didn’t quite buy me a plane ticket). Despite the bakery getting to 45C in the summer (I’m sure my sister-in-law health and safety lawyer might have something to say about that) and coming home with clothes smelling of pies and grease I strangely really enjoyed working there. The people were lovely and, well, a job all about food, what’s not to love? The best part however was lunch. For lunch I could choose anything in the bakery. I know that doesn’t seem a big deal but my 16 year old self thought being able to choose any slice or cake or pie I wanted was pretty awesome…and not have to pay for it out of my $6 an hour wage! 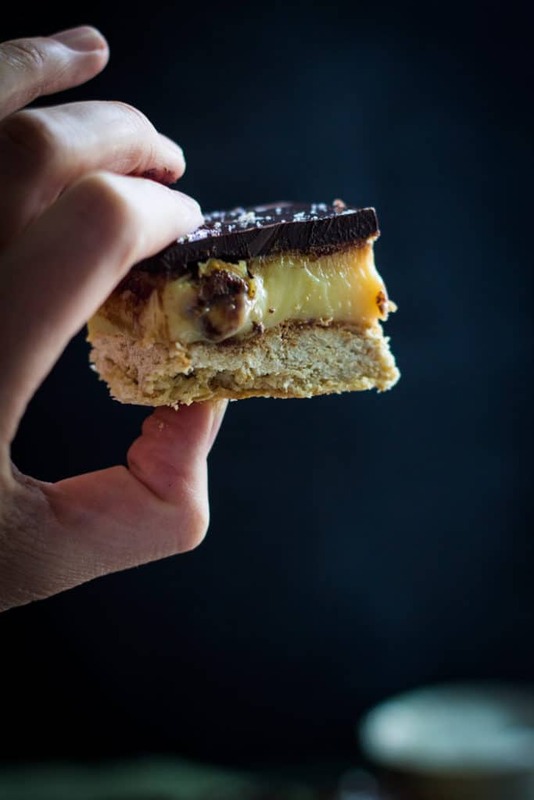 Almost every weekend my go to sweet treat was either the Chocolate and Caramel Rice Bubble Slice or the seriously decadent Caramel Slice. They were da bomb. I would often feel a little sick after consuming a slice because they were pretty rich but it was totally worth it in my mind…and my super speedy teenage metabolism would take care of it in 30 min flat. 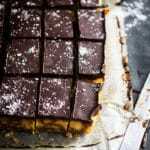 The Caramel Slice from the bakery was awesome but it was pretty standard: vanilla biscuit base, plain caramel and a chocolate topping. 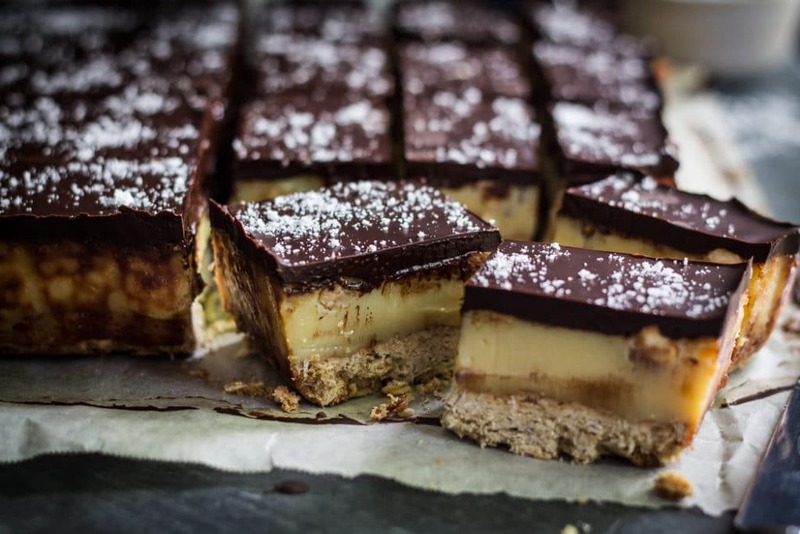 It was a ‘90s suburban bakery in New Zealand, it wasn’t Momofuku Milk Bar . A few weeks ago I felt all nostalgic after my gorgeous friend Ange gave me some Caramel Slice from a local cafe Jess’ Underground Kitchen. It wasn’t really like the old bakery standard but it was good. I can’t really describe the top but it was more creamy with a milk chocolate flavoured frosting and the bottom, that was where it was at, it had this delicious oaty base. I decided to recreate it but add in some coconut to the base and stick with my old favourite caramel topping with a few added toasted hazelnuts for crunch. My 90s self would be questioning my judgement by sprinkling flaky sea salt on top (for starters my 90s self hadn’t even heard of flaky sea salt) but my 2016 self wanted to be totally on trend (ha!) 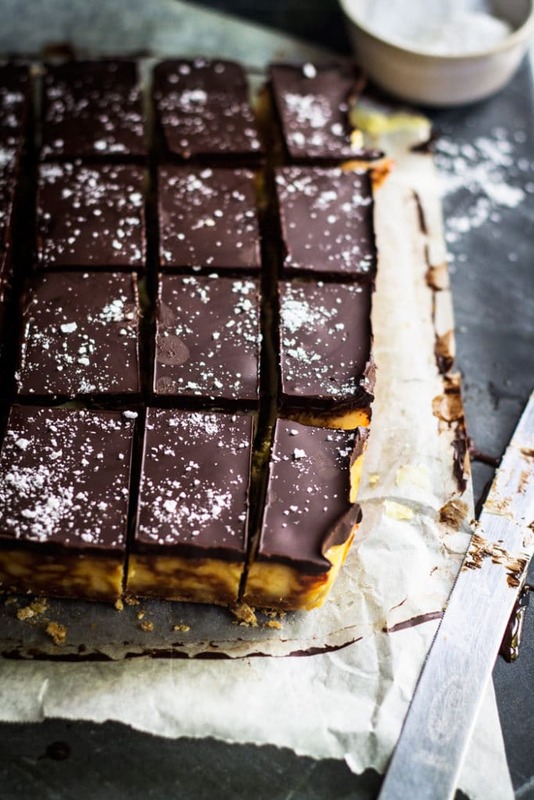 and make this a salted caramel slice…truth be told now that I’m old (yup, mid-thirties now, seriously old), and not trendy by the way, I have lost most of my sweet tooth so I need the saltiness to balance all that sweetness. 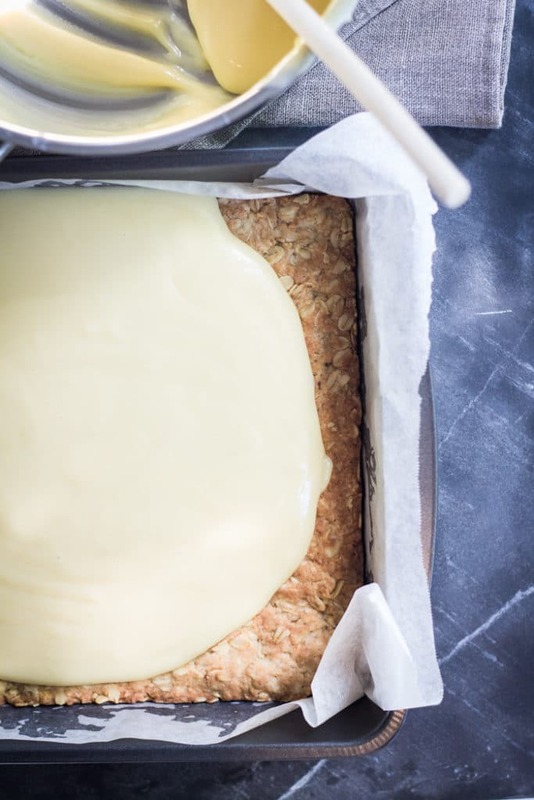 A little does go a long way with this slice so I do suggest you cut the pieces on the smallish size, you can always go back for one (or two) more. 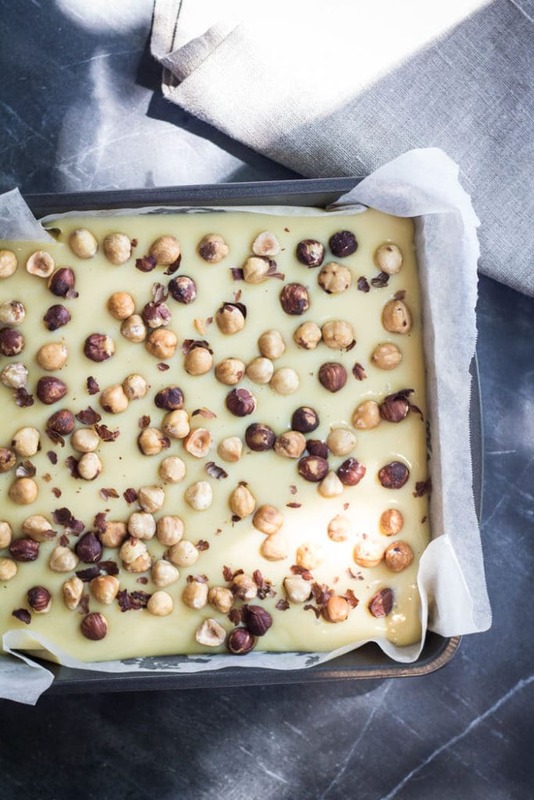 This Salted Caramel and Hazelnut Slice is serious. It’s seriously gooey, decadent, chocolatey, caramelly, oaty, coconutty and hazelnutty (yeah, I know, most of those words are made up). So good. Preheat oven to 180C/350F. Grease and line a 20cm/8in square baking tin. Put butter and brown sugar in a large saucepan and heat over low heat until melted. 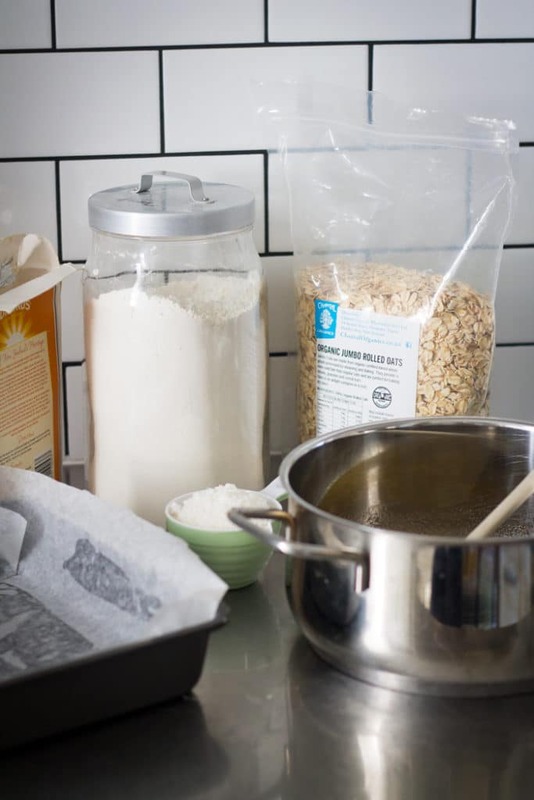 Remove from heat and add coconut, rolled oats, flour and baking powder and mix well to combine. 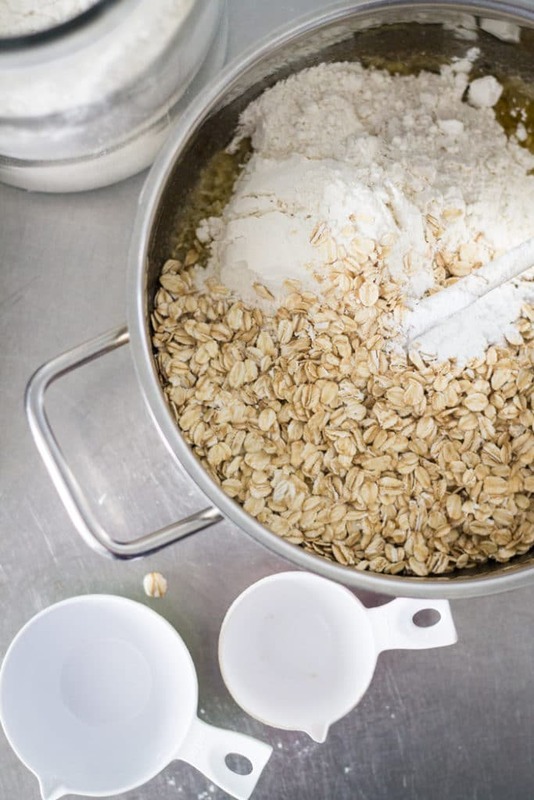 Using the back of a spoon, press the base firmly into the prepared tin. Bake for approximately 15 minutes or until golden. While the base is cooking, make the caramel filling. Give the saucepan a quick wash and dry then place all ingredients for the caramel in the saucepan over low heat stirring continuously. Cook until butter has melted and caramel has thickened slightly. Sprinkle the hazelnuts over the base. Pour over the caramel and place back in the oven for 15-20 minutes or until golden. Remove from oven and refrigerate until cold. In the photos I forgot to sprinkle over the hazelnuts first, it's okay if you forget too and sprinkle them over the caramel instead just poke them down a little into the caramel with a spoon. Place the chocolate and oil in a heatproof bowl over a saucepan of simmering water (bain marie) ensuring the bowl doesn’t touch the water. Stir continuously until chocolate is melted and smooth. Pour over cold caramel and refrigerate for another 30 minutes or until firm. Sprinkle with a little flaky sea salt, cut and serve. I’m a bit lazy and buy my hazelnuts already toasted. 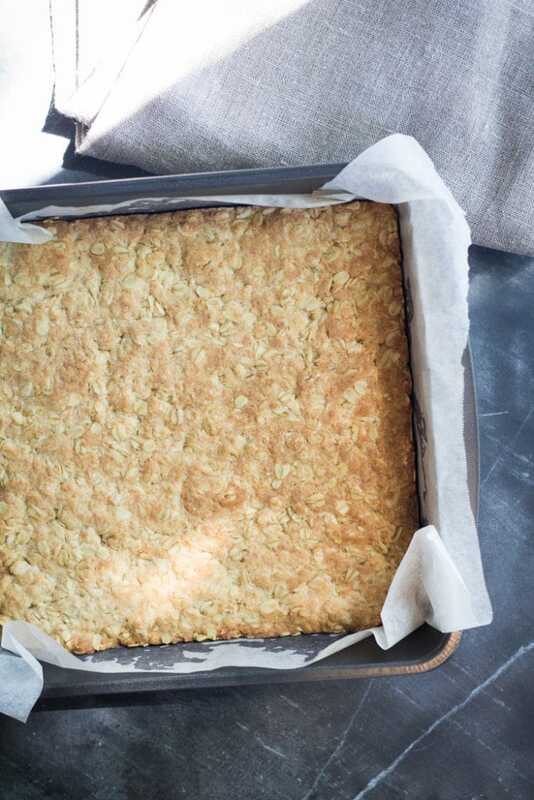 But if you can’t find toasted hazelnuts or want to do it yourself then place hazelnuts on a baking tray and bake in a preheated oven on 180C for 5-10 minutes until toasted and fragrant. Make sure you keep a close eye on the nuts as they can burn easily. Alternatively place them in a dry cast iron fry pan (skillet) and toast over medium heat until toasted and fragrant. Don’t worry about rubbing off the hazelnut skins (too much work in my mind) they’re fine in the slice. If you make this, I would love to see! Tag your photo with #mylittlelarder on Instagram or Facebook or leave a comment and some stars below! I hope there is a piece left for me when I come visiting next week. It will be so nice with a cup of tea. I will try but you do know how much that little grandson of yours loves chocolate! Wow, they look absolutely stunning! 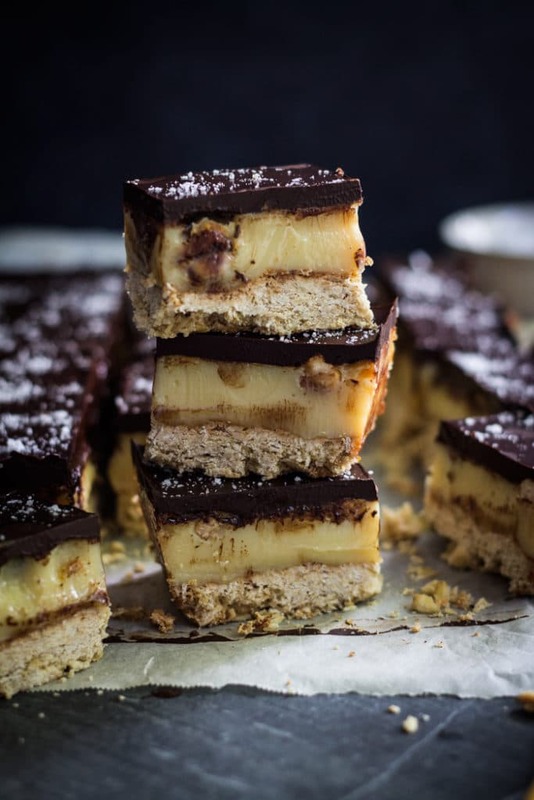 I love everything about these chocolate salted caramel hazelnut slices. Need to try this soon! Thanks so much Del! I hope you enjoy them. I just came across your blog thanks to Food Blogger Pro as I was looking for some cook’d pro theme reviews! Your blog is amazing!! I love your photography, it makes you wanna eat it straight from the screen! Firstly, I’m so so sorry it took me so long to respond to your comment, it is definitely not out of lack of love! I have been so busy lately that I haven’t touched my blog in a long time. Thank you so much for coming to my site and for your lovely comments, it is so kind of you and made my day. I checked out your blog and it is quite beautiful!